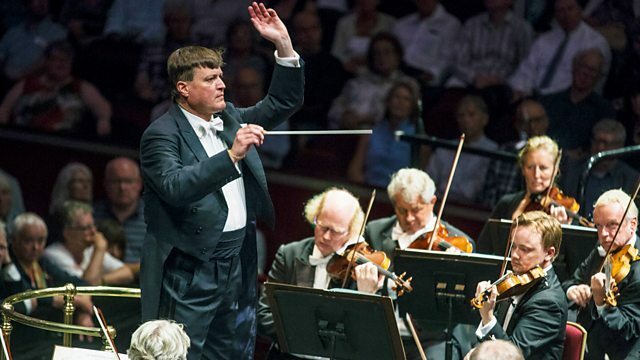 Live from the Royal Albert Hall in London, the Staatskapelle Dresden under Christian Thielemann. Mozart: Piano Concerto No 21 (soloist: Daniil Trifonov). Bruckner: Symphony No 3. Live at BBC Proms: The Staatskapelle Dresden, chief conductor Christian Thielemann and pianist Daniil Trifonov perform Mozart's Piano Concerto No.21 and Bruckner's Third Symphony. Writer and broadcaster Gavin Plumley talks to Sara Mohr-Pietsch about the life and work of the Staatskapelle Dresden and the orchestra's place in German culture. They are joined by the orchestra's artistic programmer Tobias Niederschlag. Recorded earlier in the evening at the Imperial College Union. In the first of two Proms in which Christian Thielemann displays his credentials as an interpreter of the Austro-German repertoire, he focuses on Bruckner's Third Symphony, the composer's symphonic monument to his idol Wagner - a monolithic memorial that feels at the same time intimate and personal. Before that, one of the most sought-after of today's pianists, Daniil Trifonov, is the soloist in Mozart's Piano Concerto No. 21 - whose ebullient finale contrasts with the seraphic slow movement made famous by the 1967 film Elvira Madigan. Performer: Daniil Trifonov. Orchestra: Staatskapelle Dresden. Conductor: Christian Thielemann. Conductor: Christian Thielemann. Orchestra: Staatskapelle Dresden.